Gholam is the haunting feature film debut of Mitra Tabrizian. In collaboration with her co-writer, Cyrus Massoudi, Tabrizian has created a subtle character study of an Iranian exile in London trying to make a living as a mini-cab driver and in his free time, struggling to move on from a dark and complicated past as a soldier. 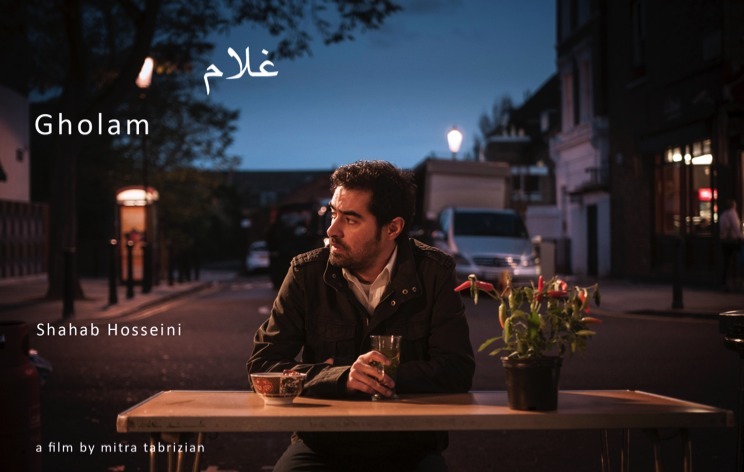 While Tabrizian’s film is, in many ways, a examination of loneliness, Gholam is not an embittered character and the film depicts his many acts of kindness and efforts to connect with his more established Iranian counterparts in London. Born in Tehran, Tabrizian lives in London and teaches photography to graduate students at the University of Westminister. Her work as an artist has examined themes of geopolitical conflict, exile and the universal need to maintain a sense of home. Gholam has been screened at fesitvals in recent months and is now being shown in selected theatres across the UK. Screenwords readers are highly encouraged to seek out this evocative portrait of one man’s life in a London that can seem indifferent and alien to newcomers. Tabrizian was interviewed during her recent promotional tour for Gholam. Can you tell me a little more about the origins of Gholam? The film is loosely inspired by a photographic project I did a few years ago on ‘Iranians in exile’. In particular, an enigmatic and charismatic Iranian cab driver, named Gholam, who despite volunteering to participate, and liking the idea, was reluctant to tell his story. Shorty after the project ended, he disappeared without a trace! So he made an impression to say the least! On that basis and some information I had together with Cyrus Massoudi (the co-writer) we developed the story, partly fact and partly fiction although the ‘fictional part’, was also inspired by experiences of other exiles from the photographic project. The encounter with the stranger is the fictional part of my script, the rest is a composite of his experience and others as mentioned earlier. Can you talk about the opening shot of the film where you are not sure who is doing the talking at first? The passenger or the driver? The opening shot was in the script from the outset. I wanted to open with a long shot of Gholam driving, looking tired, melancholic, and ‘stuck’, indicating the long night. And we only see a fragment of his face and it’s only later, as you pointed out, that we realize it’s the passenger talking in the back – so [the shot was about] setting the tone; an enigmatic and a rather unusual approach to the story telling. The diversity of the Iranian exile community is done with great subtlety in the film. Did you do additional research once the initial script was finished? The photographic project gave me a great insight into the lives of the community and the diversity of experiences. I also did other research including an interesting book The Rose Garden of the Martyrs’, by Christopher de Bellaigue, which was illuminating as to the effect of the war and the demoralisation and disillusionment, which inspired the two characters, the unnamed mysterious Iranians. All the characters in the film, in one way or another are alluding to the people that I either met or read about. Can you talk about a bit about the practicalities of making Gholam? Gholam was mainly funded through private investors, including collectors who had acquired my work in the past and kindly supported the project. We also had some smaller contributions from a couple of institutions, and a substantial support from a post-production company, without which the film would have not been completed. The company director really liked the film and decided to help finishing the film, so we got lucky, but it’s been a tough journey! Were there any touchstones – other films, books, painting, etc – that influenced or set the baseline for the kind of mood, pacing and look you were striving for? At no point, did I want to make a film like any others no matter how influential. As there is always a fantasy of attempting at ‘originality’, no matter how slight! So, on that note, Jean-Pierre Melville’s Le Samurai (1967), his treatment of an enigmatic hit man (Alain DeLong), as a ‘solitary figure’ and the cool detached style of the film, was inspirational! There is a quote at the beginning of his film; “there is no solitude greater than a samurai’s”. It’s the concept of ‘solitude’ that I wanted to explore/portray in Gholam, but differently, to see ‘what remains inside an individual’ who has been through a revolution, a war and a change of landscape. How did your work as a photographer inform your collaboration with the cinematographer on Gholam? Coming from a photographic background, I had a pretty good idea about the look of the film, very ‘naturalistic’ and what we might call a ‘raw aesthetic’. Dewald Aukema and I discussed the idea at length and he agreed with the approach and did a great job at realizing it, which was not easy, when you try not to draw attention to the lighting, camera movement (for most parts) etc. to hook the audience without distractions. One of the things I particularly liked about your script is the awareness of how Iranian political issues still shape the expatriate community, but as a viewer you don’t need to know exactly what the specifics are. How did you strike that balance between mystery and information overload? The balance between mystery and information was a difficult one! Cyrus and I did several drafts. We knew we had to rely upon intimation and implication, considering the current atmosphere, but the question was to what extent, that we do not lose the audience. In the end we decided to give some information about Gholam’s past and his experience of the war as a 14-year-old – war still plays an important part in Iranian culture – and give some idea about the historical context. The film is set in 2011, the start of the Arab Spring in Tunisia, and the reemergence of the Green movement in Iran. Neither of which succeeded. So, it is within this context, i.e. the impossibility for an alternative that the story is told. Hence it doesn’t matter who the two unnamed Iranians are and what they want him to do – so we left it ambiguous. Whether we got the balance right or not remains to be seen? I hope there is enough intrigue for the audience to relate to. Except for Shahab Hosseini and Nasser Memarzia, your cast is largely drawn from individuals who are not familiar faces to viewers or are non-professional actors. Can you talk a little bit about the casting process and working with first-time actors? With the non-actors I wanted them mainly to ‘play themselves’, so I cast according to their characters and who they are. And we did some rehearsals to make sure they were not self-conscious/aware of the camera. Except for the man (Parvez Jahed) in the dream who is a film maker and critic, but I always liked his deadpan style and thought would be a good fit for the role. And he kindly agreed. The rest were actors, the majority of the Iranians are in fact well known in the Iranian community, including Behrouz Behnejad (the garage owner) who was one of the most prominent Iranian actors before the revolution and since his exile in 1979, he refused to accept parts he considered as stereotypes, including the TV series, Homeland. This was one of the few scripts he’s been offered that he liked. So, the film brings together two of the most influential actors from before and after revolution, Behrouz Behnejad and Shahab Hosseini, both were aware of each other’s work and this was their first collaboration. Our next project, The Far Mountains, was selected for the Berlinale Talent Project this year. We had interests from a few European production companies for a possible co-production, still at early stage, but it’s exciting as it provides the infrastructure that we never had for Gholam! The story takes place in a small town in Iran with the main character a 12-year-old boy. We are pleased that Shahab Hosseini has already agreed to play the father, which is an important and complex role. Lee Hill is a film critic and author.